UTTARAKHAND is exploring new strategies to make full use of the state’s solar energy potential. The state government recently launched a scheme for urban households, commercial establishments, and business developers to help them set up small-scale rooftop solar power plants that can be connected to the grid. Households which opt for the scheme will not only get power during power cuts from the plant, but can also earn a profit by exporting any excess electricity they generate to the grid. The Grid Interacted Rooftop and Small SPV (solar photovoltaic) Power Plant in Uttarakhand was launched on August 20 this year. The state aims to install a capacity of at least 2,500 kW of power by the end of this fiscal year. “Applications for nearly 1,700 kW have already been received,” says A K Tyagi, chief project officer of the Uttarakhand Renewable Energy Development Agency. The programme is backed by two incentives—a subsidy for installation of the plant and a high feed-in tariff. Applicants for rooftop solar projects are eligible for a subsidy of 30 per cent under the National Solar Mission of the Ministry of New and Renewable Energy. The remaining 70 per cent of the cost will have to be borne by the applicant. The state is also planning to provide loans through banks at subsidised rates from next year to help people raise capital, says Tyagi. The Uttarakhand Power Corporation Limited will pay Rs 9.20 for every excess unit of power received by the grid, says Tyagi. Rates for power from conventional sources in Uttarakhand vary between Rs 2.30 and Rs 3.50 per unit. As per the provisions of the Electricity Act, 2003, the Uttarakhand Electricity Regulatory Commission has set a solar power consumption target of 0.05 per cent for 2013-14. This means that of the total electricity consumed during the period, 0.05 per cent, has to be generated using solar power. The state had a solar installed capacity of 5.05 MW as of March 2013, connected to the grid, which helped it in meeting the target for 2012 -13. The entry level capacity of rooftop plants has been kept at 300W per establishment to make common households a part of the initiative. But the scheme is applicable to solar plants of up to 500 kW capacity. The programme has been designed keeping in mind the possibilities of various business models. It allowsÃ”Ã‡Ãªany type of agreement between a third party and the owner of the household where the plant is located. An important aspect of a rooftop solar power plant is battery backup. For utilization or feeding the grid, the electricity produced by a solar power plant needs to synchronise with the voltage and frequency of the grid. During power cuts, electricity from the solar power plant cannot be utilised or exported because of the mismatch between the frequency in the grid line and the solar power plant, says Ananth Aravamudan, associate director, Selco Labs, a Karnataka non-profit. Therefore, it is essential to have a backup or storage (batteries, in this case), he adds. The programme covers battery support only for plants with 300W to 100kW capacity. To explain, an applicant will get a 30 per cent subsidy on the total project cost if the plant is of 300w to 100kW capacity. But for plants with 100kW-500kW capacity, the subsidy will be only for the project costs, excluding battery. Having a battery backup is expensive and can be about 20 per cent of the capital cost of the project. Batteries also need to be replaced every six to eight years, says S K Dwivedi, a solar power plant component supplier in Raipur. 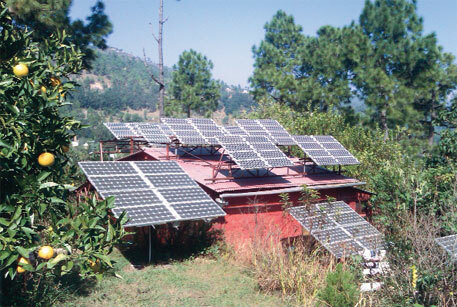 Uttarakhand has been engaged in setting up solar-based home lighting systems, especially in rural and remote areas. Around 600 villages in the state have already been provided with such lighting systems. The state had an energy deficit of 5.5 per cent for 2012-13. Other states are also aiming at increasing their power generation capacity through the rooftop solar plant model. Kerala and Andhra Pradesh started their programmes earlier this year, while Tamil Nadu is in the process of drafting the scheme.